Geisel Library. Photo by Erik Jepsen, Publications. 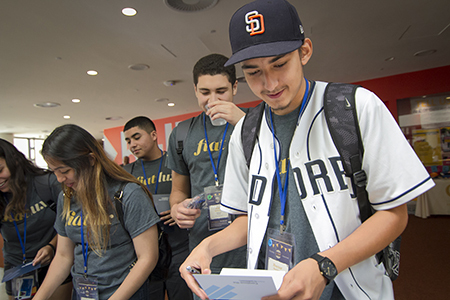 “UC San Diego is my dream school,” said Hector Enriquez, an incoming college freshman student who graduated from San Diego’s Lincoln High School. Enriquez hoped to attend the University of California San Diego since he first visited the campus in 7th grade, but his family would not have been able to cover the cost of his education. Thanks to the Chancellor’s Associates Scholarship at UC San Diego, he will begin his studies on campus in September, becoming one of the many who have benefited from generous philanthropic support donated last year to the Campaign for UC San Diego. More than $312 million was raised during fiscal year 2017-2018—a record-breaking amount for any San Diego institution of higher education in a single year. The funds go toward the university’s $2 billion goal as part of the Campaign for UC San Diego. Since the campaign was launched in 2012, $1.6 billion has been raised. The $312 million fundraising total for the fiscal year ending June 30, 2018, represents a 17 percent increase from the prior year, when philanthropic support totaled $267 million. UC San Diego’s base of over 185,000 alumni has played an increasingly significant role in supporting the campaign to ensure its success. Alumni leaders comprise 52 percent of the Campaign for UC San Diego Cabinet and are taking an active role, not only as donors, but also as campaign ambassadors. This year, 60 percent of philanthropic support was designated to support campus departments—fueling new programs, centers and initiatives within the campus’ academic divisions. The impact of these gifts and grants is already evident on campus, driving new programs and enhancing existing ones, facilities and initiatives with significant impact. UC San Diego is focused on enhancing the student experience for generations to come. An important aspect of ensuring student success is providing support to make certain that students, like Enriquez, can focus on their studies—instead of worrying about how to cover the cost of their education. Incoming student Hector Enriquez (at right) is just one of the many beneficiaries of private support to UC San Diego this year. Photo by Erika Johnson, University Communications. To help address this need, Chancellor Khosla established the Chancellor’s Associates Scholarship Program, supported in part by annual gifts from the campus’ key donor group. The scholarships are designed to ensure access and affordability to higher education for qualified local students who come from low-income backgrounds. The program has grown from 42 scholarships awarded at its inception in 2013 to a total of more than 850 scholarships awarded as of fall 2018. In addition to what amounts to a full-ride scholarship to UC San Diego, all students have access to a suite of support services to ensure their academic, emotional and social success on campus. Enriquez plans to major in human development and would like to become a high school history teacher. “I’m proud to be the first in my family to attend college. I want to be an example to my younger siblings,” he said. UC San Diego is currently undergoing an exciting physical transformation, creating a more connected campus for students, faculty and staff—and one that will increase our positive impact on local and global communities. UC San Diego alumnus and Qualcomm co-founder Franklin Antonio donated $30 million to the university in support of the campus’ Jacobs School of Engineering. In recognition of the generous gift, UC San Diego will name a planned building for engineering research and education Franklin Antonio Hall. The approximately 200,000-square-foot building is being designed from the ground up to facilitate cross-disciplinary collaborations that are critical for solving the toughest health, energy, autonomy and security challenges facing society. Franklin Antonio Hall is scheduled to open by fall of 2021. The Koman Family Outpatient Pavilion opened in spring, thanks to support from Bill and Amy Koman and their family. Photo by Derek Plank. 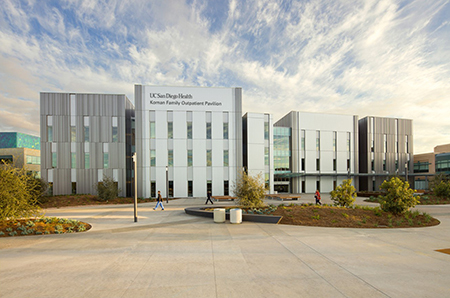 UC San Diego’s Koman Family Outpatient Pavilion opened in March. The new facility offers the best in clinical care and translational medicine in one location, so that patients need not travel from site to site for different treatments. The Pavilion, located on UC San Diego Health’s La Jolla Campus, is named in honor of Bill and Amy Koman and family in recognition of their generosity and dedication to advancing health care in San Diego. Philanthropy has also played a driving role in allowing UC San Diego to continue spearheading revolutionary research with the potential to benefit billions around the globe. Taner Halicioğlu speaks at the the opening of the Halicioğlu Data Science Institute in March. Photo by Erik Jepsen, Publications. 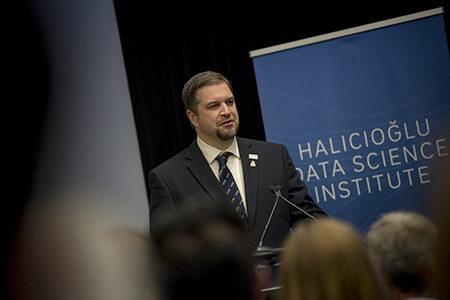 The campus opened the Halicioğlu Data Science Institute, or HDSI, in March to build on the university’s strengths of multidisciplinary collaboration and data science. The institute is named in honor of UC San Diego computer science alumnus Taner Halicioğlu, an early Facebook employee whose $75 million gift to support data science initiatives was announced last spring. The new institute at UC San Diego allows researchers across campus to incorporate data science into their respective disciplines to better understand and make predictions about the world around us. In fall 2017, UC San Diego celebrated the dedication of a new building for the divisions of Biological and Physical Sciences with a special announcement: the cutting-edge science facility would bear the name Tata Hall for the Sciences, or Tata Hall, in recognition of a $70 million gift from the Tata Trusts, which was committed last year to create the binational Tata Institute for Genetics and Society. The Tata Institute for Genetics and Society was established as a collaborative partnership between UC San Diego and research operations in India. The institute’s mission is the advancement of global science and technology through socially conscious means to develop solutions to some of the world’s most pressing challenges, from public health to agriculture. To date, the Campaign for UC San Diego has achieved 80 percent of its $2 billion goal. The campus anticipates that it will reach its goal in advance of the campaign’s close in 2022, yet as Chancellor Khosla notes, the campus is just beginning an unprecedented physical, intellectual and cultural transformation powered by private support. “As our university looks to the future with optimism, UC San Diego and its philanthropic partners will continue to embrace a tradition of doing things a little differently to make the world a better place,” added Khosla. To learn more about the Campaign for UC San Diego, please visit campaign.ucsd.edu.